We have all made New Year's resolutions. Some have stuck, while others were destined to fail the moment they were born. Sometimes they're trite. One year I resolved to have painted nails, and succeeded, though they were chipped most of the time. Other times they're well meaning. Be good to others, is one I had. Oftentimes they disappear, simply forgotten, or fail because they are too great or too rigid. Taking into account so much of what has happened in my life the past few years, I wanted a good one. I wanted to solve my feelings of disappointment in myself, and stress. It's essential for me to always be striving and see no end in sight, just a better life. I've always had trouble juggling work, friends, relationships, artistic ambitions, taking time out for myself, and basic responsibilities like housework. I go in phases. Sometimes I only do things that I love and make me happy, ignoring responsiblities. Other times I work, work, work, ignoring friends and family. So this year, I've resolved to improve balance. I want a day filled with work, chores, fun activities, friends, family, and writing. I want to be able to do everything and not too much of just one in a day. I waited to share this resolution as I have put it to practice for the majority of January. It seems to be working. I feel so much less stress and greater happiness. What can I say? I'm on the path to a better me. Scones were something I could never find in vegan version. I would see vegan cupcakes, vegan cookies, vegan cakes, but never vegan scones. They weren't something that I ever made when I was vegetarian, and since I never saw them in vegan baked goods shops, I assumed executing them in a vegan way was impossible, or simply too difficult for a novice. I don't remember how I came across this recipe, but what attracted me most is that it was easy. I'm still a fledgling baker. Sometimes I use baking soda when I should be using baking powder, or confuse teaspoons for tablespoons, and it looks fine until I bite into it and immediately am overwhelmed with that chalky, foul taste. I was worried that I would mess it up terribly, but since there are so few instructions, it soon became one of my favorite things to make (not to mention the fact that they are delicious!). Begin by setting your oven to 400 degrees Fahrenheit. Take all of the dry ingredients and add them together in a medium to large sized mixing bowl. Mix them well, then add all of the liquid ingredients. Mix until completely combined then take a medium to large sized baking sheet out and apply vegetable oil to prevent sticking. Using a 1/4 measuring cup, scoop out the dough to put on the baking sheet. Before putting it in the oven, sprinkle the tops of the scones with sugar. This recipe should yield about eight medium sized scones. After about 12-15 minutes, the bottoms of the scones should be lightly browned and they can be taken out of the oven at that point. Remember, that the tops will not change color significantly, so the bottom is the best way to tell if it is done. Each oven is different, so the scones may bake faster or slower. Just keep an eye on them. The original recipe had a tiny bit less sugar and did not call for vanilla. 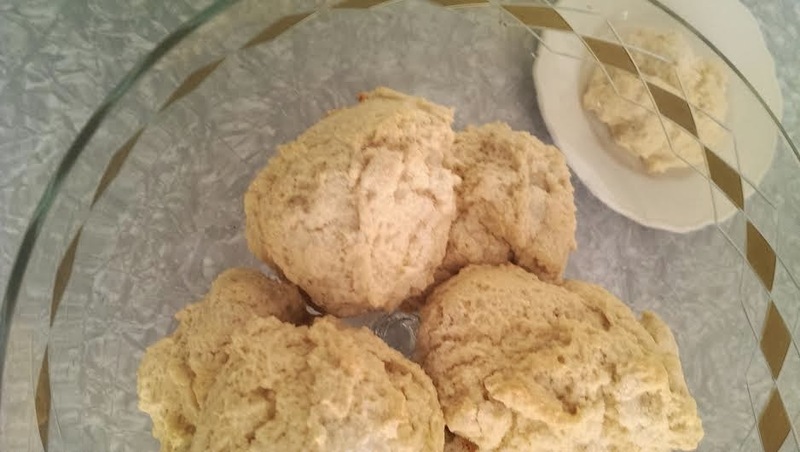 I like eating my scones plain, so adding just a bit more flavor was perfect. This recipe is so versitle because people can add fruit, berries, jam, or chocolate chips to get something a bit more decadent. They could even top them off with a vegan frosting.